"Heat stress at the end of the century will skyrocket in a way that we cannot even imagine." This was one of the warnings of Professor Koen De Ridder of the Flemish Institute of Technological Research (VITO) of Belgium in his conference on November 15th within the "Facing Climate Change" series of the Re-City platform organized by the Foundation Catalonia Europe with the collaboration of BBVA and the support of the Barcelona City Council, the Metropolitan Area of Barcelona and the Generalitat de Catalunya. 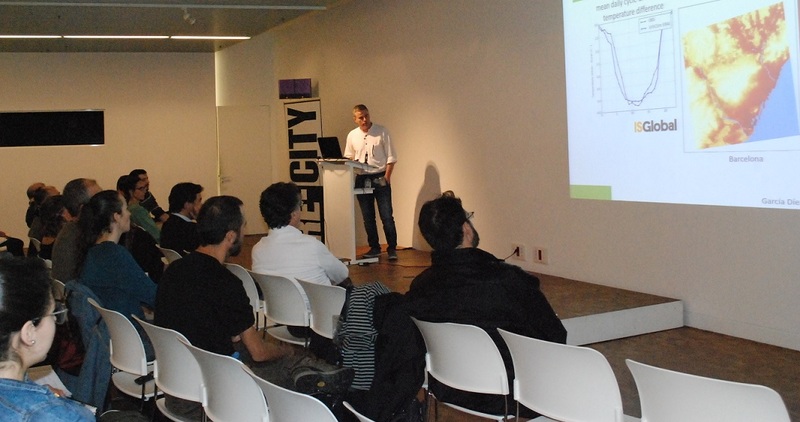 The conference was moderated by Xavier Rodó, ICREA researcher, head of the Climate and Health research program of ISGlobal, and scientific advisor of ReCity's "Facing Climate Change" cycle. The expert in urban climate and air quality, Koen De Ridder, has developed in the VITO Institute the UrbClim model, one of the few that offer information in detail at the local level on indicators such as climate, temperature, pollution, extreme weather changes or the so-called heat islands in cities (Urban Heat Island, UHI) that carry temperatures higher than their rural environment with direct effects on the health and well-being of cities. Unlike this model, most existing ones only offer macro data at the regional or global level. Specifically, it is an European program that allows simulations of the climate in 100 European cities and explains microclimatic effects such as the urban heat island. Thus, simulations have been carried out with a high degree of certainty in cities such as Barcelona, Paris, London, Berlin, Athens or Brussels, following the scenarios of the UN Intergovernmental Panel on Climate Change (IPCC) until the end of the 21st century. In Barcelona and its metropolitan area, this research is carried out by Xavier Rodó's team at the Global Health Institute of Barcelona (ISGlobal), taking into account indicators such as temperature, rainfall, number of hot days, air pollution, energy and transport, forest fires, heat-related diseases or aquatic ecosystems, among many others. According to these studies, urban heat islands can cause higher mortality rates, higher hospital admissions, more premature births, less economic and labor productivity, infrastructure damage and an increase in energy consumption. Koen De Ridder warned that episodes of extreme heat will multiply by ten in European cities at the end of the century. Currently, heat islands in cities are already causing significant differences in temperature in relation to their rural environments. For example, in Paris the temperature in the heat islands is 5 degrees higher than its surroundings, and in the case of Barcelona the difference is between 1.5 and 3 degrees higher. The islands of heat are manifested mainly at night and in cities with a greater density. For this reason, cities have on average twice as many days of extreme heat as their rural surroundings. In France, for example, the studies of the VITO Institute have calculated a 140% increase in mortality during the strong heat wave of 2003 that would have caused some 70,000 deaths in Europe as a result of extreme heat. If we compare, for instance, Hurricane Katrina caused less than 2.000 deaths in USA. One of the alternatives that De Ridder proposes are the infrastructures and green areas that help to cool cities and avoid exceeding the heat thresholds from which the health and well-being of people is put at risk. Proposals that, beyond the scientific debate, require a political commitment for the leaders to develop them, said the two experts, Koen De Ridder and Xavier Rodó.